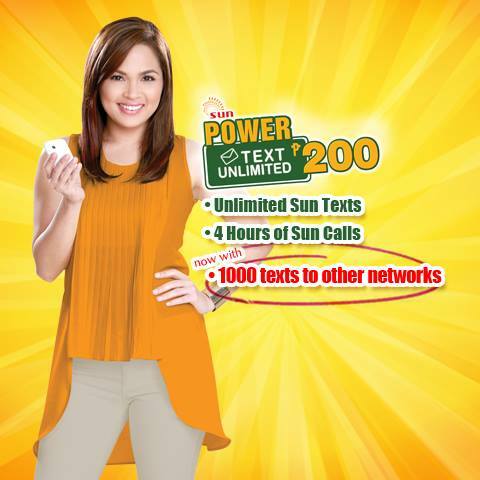 Good news to Sun Cellular subscribers who love to register 1 month unli text promo, you can enjoy the new Power Text Unlimited 200 now with 1000 free texts to all networks. If you remember TU200 has only 500 free other network SMS before they recharged this. It also come with 4 hours Sun calls aside from 24/7 texting for 30 days. Sun Cellullar added more services when you subscribe to their TU200 promo. Aside from unlimited text to all networks, TRINET call is now up to 5 hours plus free Facebook and chat using FB, Viber and more. Or you can inquire to your Sun Xpressload retailer to avail. It’s bigger and 2 times more power plus free text that you can consume the whole month. Another good news to Sun users, they are now improving their signal quality for you to continue enjoy their services and promos. You can visit Sun Text Unlimited website and social media pages for more updated prepaid offers. how do i check when's the expiration date of my TU200, i forgot when exactly i registered for the promo, and i believe sometimes i'm not receiving the alert that the promo's about to expire. thanks! Dial *221# and press call button, and you will receive a few messages about the promo. i cant register TU200 HOW? until when is the promo? May free data facebook ba ang Tu200? mkaka google rin ba ako nito or youtube then viber? do i need to load more than Php 200 before I can register? Nagpa load ako april 6 2015 nang tu200 bakit naka lagay sa aking na ma expire yun calls ko april 9 2015 diba within 30 days pa ma expire? anong ibig sabihin nyan? nagpa load ako april 6 2015 nang tu200 bakit yun calls ko ma expire in april 9 2015 diba within 30 days yan pag ma expire? ano to? active pa po ba to promo na to? Dati nakakapagregister ako sa sun broadband ng TU200, ngayon hindi na. Bakit ganun? Sayang 200 ko. meron bang Free FB ang TU200? How to call PLDT number? It says i dont have sufficient load. I think, you must include area code before calling any pldt number. I loaded my number with TU 200. I can't open my FB Account. it always say no internet connection. i already open my data but its still not working. please help me..